The Western Undergraduate Exchange is a regional tuition agreement offered through the Western Interstate Commission for Higher Education (WICHE) that gives students who attend school at a participating college outside of Colorado at a reduced tuition rate. 15 WICHE States including: Alaska, Arizona, California, Colorado, Hawaii, Idaho, Montana, Nevada, New Mexico, North Dakota, Oregon, South Dakota, Utah, Washington, and Wyoming. 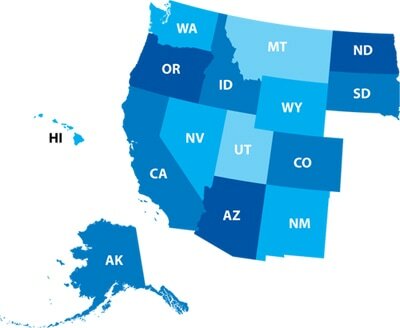 If you reside in one of the participating states, you are eligible to request tuition at a reduced rate at participating 2- and 4-year colleges in any of the listed states. This can be a significant reduction in cost compared to the non-resident tuition rates. What are the choices for college? Search the WUE Database to see which institutions participate and which programs they have available. There are currently around 150 public colleges and universities that participate in WUE; not all public institutions in every WICHE state participate in the program. Some participating schools have opened their entire curriculum on a first come, first serve basis. However, the schools have the option of excluding certain high demanding majors from the WUE program. If you enroll through WUE under a specific major and then later change your major, you may lose your WUE tuition rate discount if you change your major to a ineligible major. Limited amount of spots; Apply Early!